NASA has launched its next Mars rover, capping a long-awaited mission to investigate whether the Red Planet could ever have hosted microbial life. The car-size Curiosity rover -the Mars Science Laboratory, or MSL- blasted off atop its Atlas 5 rocket at 10:02 a.m. ET Saturday, streaking into a cloudy sky above Cape Canaveral Air Force Station. The huge robot's next stop is Mars, though the 354-million-mile (570-million-kilometer) journey will take eight and a half months. Curiosity should revolutionize our understanding of the Red Planet and pave the way for future efforts to hunt for potential Martian life, NASA researchers said. "It is absolutely a feat of engineering, and it will bring science like nobody's ever expected," Doug McCuistion, head of NASA's Mars exploration program, said of Curiosity. "I can't even imagine the discoveries that we're going to come up with." Curiosity sports a rock-zapping laser and equipment designed to identify organic compounds — carbon-based molecules that are the building blocks of life as we know it. Some of these instruments sit at the end of Curiosity's five-jointed, 7-foot-long (2.1-meter) robotic arm. The arm also wields a 2-inch (5-centimeter) drill, allowing Curiosity to take samples from deep inside Martian rocks. No previous Red Planet rover has been able to do this, researchers say. "We have an incredible rover," said MSL deputy project scientist Ashwin Vasavada of JPL. "It's the biggest and most capable scientific explorer we've ever sent to the surface of another planet." Curiosity is due to arrive at Mars in early August 2012, touching down in a 100-mile-wide (160-km) crater called Gale. While the rover's launch was dramatic, its landing will be one for the record books, if all goes well. A rocket-powered sky crane will lower the huge robot down on cables — a maneuver never tried before in the history of planetary exploration. 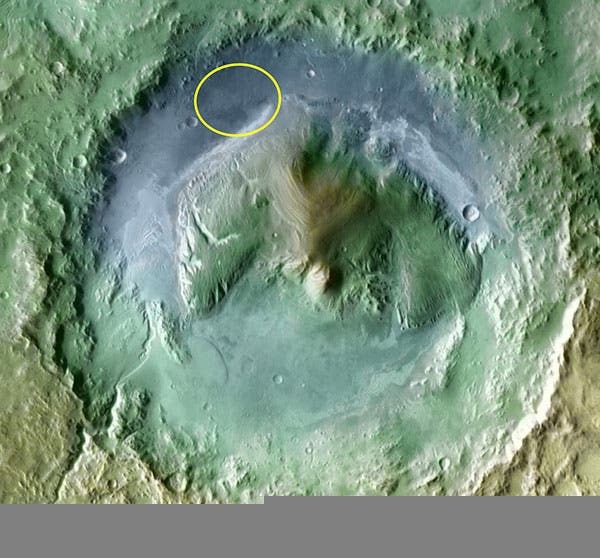 A giant mound of sediment rises 3 miles (5 kilometers) into the Martian air from Gale Crater's center. The layers in this mountain appear to preserve about 1 billion years of Martian history. Curiosity will study these different layers, gaining an in-depth understanding of past and present Martian environments and their potential to harbor life. "Going layer by layer, we can do the main goal of this mission, which is to search for habitable environments, " Vasavada said. "Were any of those time periods in early Mars history time periods that could have supported microbial life?" If Curiosity climbs higher, its observations could shed light on Mars' shift from relatively warm and wet long ago to cold, dry and dusty today, researchers said. "We want to understand those transitions, so that's why we're headed there [to Gale]," said Bethany Ehlmann of JPL and Caltech in Pasadena. Curiosity isn't designed to search for Martian life. In fact, if the red dirt of Gale Crater does harbor microbes, the rover will almost certainly drive right over them unawares.The MSL is a key bridge to future efforts that could actively hunt down possible Martian life forms, researchers said. Curiosity's work should help later missions determine where — and when — to look. "We don't really detect life per se," Vasavada said. "We set the stage for that life detection by figuring out which time periods in early Mars history were the most likely to have supported life and even preserved evidence of that for us today."